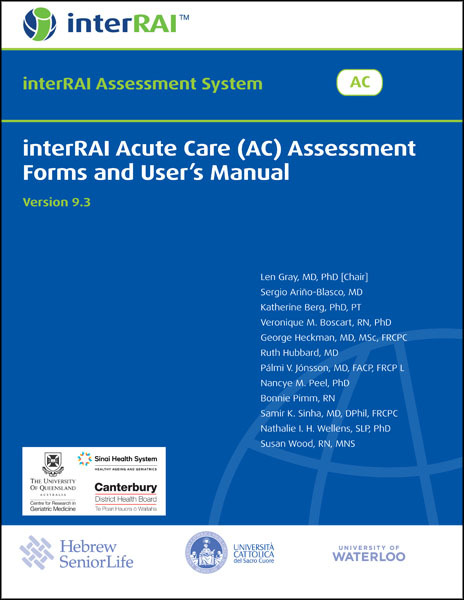 The interRAI Acute Care (AC) assessment is a key component of the interRAI Hospital Assessment Systems. It is designed for use among all adult patients who are admitted for an overnight stay in hospital. The interRAI AC is designed to form part of the general nursing admission assessment that is offered to all adult patients on arrival at an inpatient unit. The interRAI AC is to be used alongside other nursing assessment information that usually includes biometric (for example, pulse and blood pressure) and administrative information. The interRAI AC comprises two forms: the Admission Form is completed when the patient arrives at the inpatient unit, and the Discharge Form is completed on the day of discharge. PLEASE NOTE: This version of the interRAI AC is a completely new instrument. The former interRAI AC version 9.1 has been renamed the interRAI Acute Care for Comprehensive Geriatric Assessment (AC-CGA) – a system designed to support assessment of older patients with complex needs. However, if you are looking for the interRAI AC version 9.1, it is still available for sale. Please click here for AC 9.1. This book is one of six titles included in the interRAI Hospital Assessment Systems. When purchased as a bundle, these titles are eligible for a 20% discount off their individual list prices. The interRAI AC 9.3 is included in all three of these bundles - click the bundle name below to learn more and to place your order. Over the past five years, the interRAI research collaboration has developed and extensively tested this new assessment system which supports assessments, care planning, and quality improvement across the hospital continuum.